Recent misrepresentations by the Lake Sun regarding Presiding Commissioner Kris Franken and his end-around attempts to rewrite Article 800 called into question the role of local print media in local politics. The most recent article, a slanted presentation of events authored by Lake News reporter and Westside Star editor Amy Wilson, read like a press release from Lord Franken’s desk. In this blatant piece of public relations propaganda, Wilson misstated several facts and created a false narrative that focused on a political group’s attendance and involvement in Planning and Zoning board meetings instead of reporting facts. For those who actually attended the meeting, it begs the question: Who is REALLY calling the shots at the Lake Sun, for them to willingly print such a lazy, sloppy, obvious white-wash? Who would have them sell their credibility for pennies on the dollar? That answer, it would appear, can be found by looking to another local source of media, radio station KRMS. 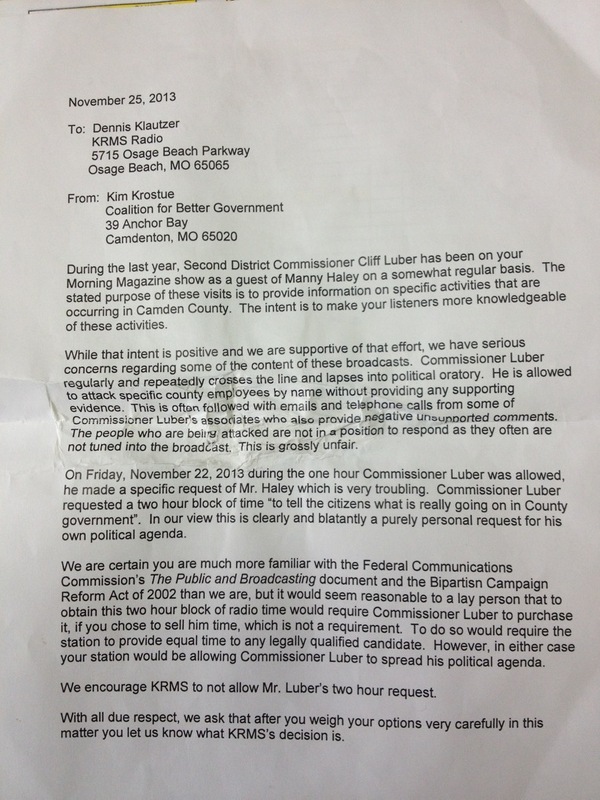 The letter below was sent to 97.5 KRMS before Manny Haley was terminated. The author of the letter was Kim Krostue. In this letter, Krostue purports to represent a group called the ‘Coalition for Better Government’. Krostue is better known in his position with the Camden County Republican Club. On that group’s facebook page, he is listed as Vice President, while cohort Suzie Johnson is listed as President. This letter, authored by Krostue, is full of ‘baseless claims’. Krostue and his coalition of comrades, Joe Roeger, Suzie Johnson and her husband, have made a habit of trying to silence Second District Commissioner Cliff Luber. They have followed him around to town hall meetings, in order to attempt to disrupt and intimidate. They have repeatedly supported the punitive and selective application of planning and zoning, even going so far as to rally in support of Don Hathaway after his recent suspension. They have consistently united in opposition to government transparency, as the letter above clearly demonstrates. Krostue, crying foul at what he considers are Luber’s unfounded claims, has no problem issuing his own. The assertions in his letter are completely unproven. As was pointed out recently in the editorial pages of the Lake Sun, Krostue has no problem manipulating information in order to mislead the public. Shame on him, his coalition and the Camden County Republican Club for asking our local media to share his pathological ways. This entry was posted in American Spring Original Articles/Opinion, Camden County Commissioner, Gatehouse Media, Lake Sun, Local Media, Local Missouri Media bias, Local News, Local politics, Media, Missouri's Ministry of Truth. Lake Sun, Planning and Zoning by americanspring2011. Bookmark the permalink.